BANGI, 4 Dec 2012 – Malaysia and other countries in the equatorial region may experience disruptions in power, telecommunications and certain banking services right through to 2015 due to solar storms. Professor Ir Dr Ahmad Faizal Mohd Zain of UKM’s Institute of Space Science (ANGKASA) said data collated by researchers at the university and confirmed by other sources showed the sun is likely to spew out solar flares again during the period after eleven years when the last flare-ups occurred. In fact the most recent flare occurred during the last Merdeka Day but most people did not notice it because the flare was not directed towards earth. He received data from NASA confirming the phenomena on 31stAugust. He said Malaysians hardly noticed some interference in television and static in radio and cell-phone reception when such stellar explosions or solar storms occurred in the past. Few people in Malaysia would associate the anomalies with sun-spot activity. 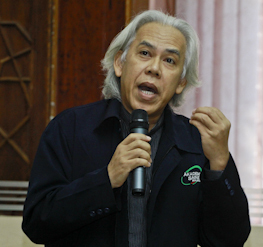 A task force has been set up at UKM to determine the peaks, or highs, of the solar flares, said Prof Faizal, who is Associate Principal Fellow of ANGKASA. He was presenting his findings at an ANGKASA seminar on Atmospheric Science today. He said America’s National Aeronautical and Space Agency (NASA) had also found a similar trend. Anything that uses electronics and satellite communications equipment will be affected, including Automated Teller Machines (ATMs) of banks while Global Positioning Systems (GPS) will be less accurate because of the massive amounts of ionization spewed out from the sun. Communication device users in Malaysia could also experience some disturbances in reception when the fenomena occurs. Prof Faizal said the sun goes through eleven-year cycles and will near the peak of cycle 24 next year. As we get closer to that peak, flares are going to get more intense. However, according to NASA, this solar cycle may prove to be lacklustre by historical standards. Between 2008 and 2010, scientists recorded the low ebb of solar activity in the past century and there is some conjecture that this Cycle 25 may be especially weak, following the theories of NASA solar physicist David Hathaway who supposed that the churning behaviour in the sun’s interior is actually slowing down and the entire solar cycle may be disrupted as soon as 2022. Nevertheless, Prof Faizal said that with an aging power infrastructure and a growing reliance on communications technology, there is now some concern as to what a powerful flare would do today. 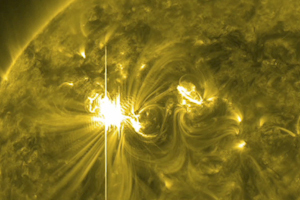 In space, solar activity can damage satellites and endanger astronauts. Passengers flying along polar routes may even experience a substantially higher dose of radiation, forcing some flights to re-route. He said that a solar flare can have many different effects on the earth as well as on space explorations. The hard x-rays emitted from a flare, as well as bursts of highly charged protons called proton storms, can inflict damage to both astronauts and spacecraft. Soft x-rays enter the earth’s ionosphere and can disrupt radio communications. Ultraviolet radiation and x-rays can also cause the outer atmosphere to heat up, creating a drag on satellites in low Earth orbit and reducing their life span. 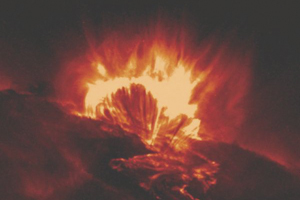 Solar flares were first observed on the sun by Richard Christopher Carrington and independently by Richard Hodgson in 1859 as localised visible brightenings of small areas within a sunspot group. Historically, one of the largest events was the Carrington Super flare of 1859 which caused the Northern Lights to be seen as far south as Puerto Rico and disrupted telegraph lines around the world. In fact, operators on the east coast of the United States found there was enough current on the line to send telegraph messages even with their batteries disconnected. Prof Faizal is presently Professor at the Faculty of Manufacturing Engineering, Universiti Malaysia Pahang (UMP). His research focuses on Radio Science and Propagation, Antenna, Radio Frequency Electronics, and GPS. He earned his PhD from Pennsylvania State University in 1990 for his research on the Ionosphere in high latitudes. He has worked with a NASA start-up company in Baltimore, Maryland, USA where he helped developed a telemetry device for the Ionosphere. He is also a founding-member of Malaysia’s first Microsatellite consortium set up in 1992. He had been Professor of Electrical Engineering and Head of Centre for Wireless and Radio Science (WARAS) at Universiti Tun Hussein Onn.